Gregory Mountain Products Women’s Maven 55 Backpack. Gregory Maven 55 pack for women is the second largest pack from a completely new series of four packs launched by Gregory in 2017. This is a very lightweight backpacking and hiking tool with a few bonuses and some unique features. The water bladder sleeve doubles as a SideKick daypack. Removable bottom straps can be used as a hip belt on the SideKick daypack. Internal divider doubles as a top flap for a lidless use. Quick-stow feature on the shoulder strap for attaching glasses. The Maven series by Gregory includes four packs for women, with 65, 55, 45, and 35 liters of volume. They all share some common features but the two largest in the group have some extra bonuses and features. The Maven 55 is sold on Amazon under the name Gregory Mountain Products Women’s Maven 55 Backpack. This is a classic top-loading pack with an adjustable floating and removable lid and an extendible spindrift collar. 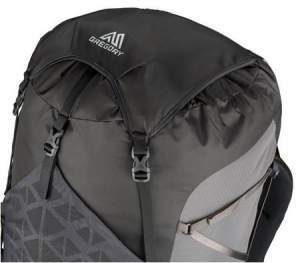 This pack allows for a lidless use in an ultra-lightweight variant: when you remove the lid, you can use the sleeping bag divider and attach it to the top of the pack as a flap for protection. This is shown in the picture below. To do this, you simply detach the divider from its 4 attachment points, and then attach it as a flap on the top of the pack. In this variant, the pack is again protected from te top and it looks like a smaller pack. 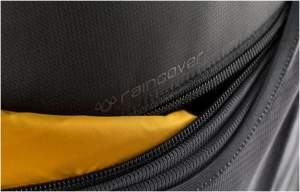 The bottom sleeping bag compartment is with the usual zipper and this is yet another alternative access to the pack, in particular when the divider is removed. One of the bonuses is the rain cover which comes stored in an external zip pocket which is beneath the front shove-it pocket. Maven 55 backpack without lid. The divider doubles as the top flap. Bonus rain cover stored in the zipper pocket on the front. The Aerolon suspension system with adjustable harness and adjustable hip belt. There are two sizes of this pack to choose your proper torso range length in the moment of purchase, and there is a small difference in volume as well. But in addition to this, you also have an adjustable torso for extra fine tuning and for your perfect fit. This is the Aerolon, a new adjustable system which utilizes an ultra-light 7 mm hollow 7001 aluminum frame which is flexible and supportive and with a new geometry. This system allows for 4 inches (10.2 cm) span of torso adjustment. Adjusting the torso is simple, just break the Velcro connection behind the panel and then slide the harness to the desired length. After that press firmly to re-engage the hook and loop connections, job done. This pack incorporates the women-specific design. The harness is contoured to fit the female figure, which implies also a narrower back panel. The hip belt is built to adjust to women’s hips. This suspension is accompanied with what they call Matrix Ventilation System, a foam-matrix back panel structure covered by a very breathable mesh with an excellent air flow and moisture evaporation. The mesh is partly detached from the pack and this adds to ventilation. The hip belt is contoured and adjustable. This is useful if the pack is used by different family members or by couples. 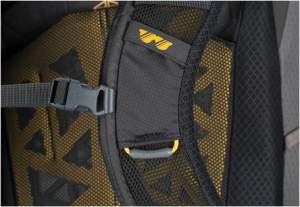 It is padded with a multi-density LifeSpan EVA foam, the same what you have on the shoulder straps. The lumbar zone is with the gripton pad system, a soft-molded silicon overlays for enhanced load transfer and energy savings. To adjust the hip belt, you have to undo the Velcro connection which keeps the hip belt pocket in place. After that loose the hip belt strap stabilizer (shown below), and pull the hip belt until you have the desired length. You should have the padded part of the hip belt all around your hips, so just try and you will find what the best is for you. After that, re-engage the Velcro and tighten the stabilizer. The quick-stow attachment for sunglasses. The pack is with very functional dual side compression straps. 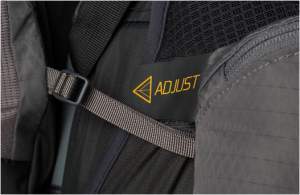 The lower straps are with the inside-out feature so you can run them through the pockets in order to compress the pack, or over the pockets to secure the items stored in it. The upper straps are v-shaped, they run twice across the sides. One useful feature is the quick-stow attachment for sunglasses, visible in the picture above. It includes a webbing loop and an elastic cord on the left shoulder strap shown in the picture. When you attach your glasses there, you can secure them with the cord. The daypack which doubles also as the water bladder sleeve. Dual bottom compression straps are also available, so you can attach a sleeping pad or a tent. They are removable if you need them to attach things elsewhere on the pack, and they can even be used as a hip belt on the SideKick daypack. The pack is equipped with a bottom loop for an ice axe or poles attachment, and this is accompanied by a tie-off higher on the front of the pack. There are four Goal Zero attachment loops on the top of the lid, and similar webbing loops are available on the bottom as well. The Maven 55 pack is hydration compatible, and here again you have a clever design used also in some other packs by Gregory, you can see it applied in their Amber 60 pack. as well as in the Stout 65. The internal reservoir sleeve doubles as an ultra-light removable daypack, which is perfect for summit hikes or for town walks. To remove the sleeve, just detach it from the two hooks inside the main compartment. It has a large zippered front pocket, and its shoulder straps are with some padding. One stretch pocket is on the front, so here you can store things which you may need when you are on the go, or your wet stuff to keep it separated from the dry compartment. Two stretch pockets with straps are on the sides, with angled access for water bottles. Dual zippered hip belt pockets are of different materials, one is mesh and the other is fabric. Two pockets are on the lid. The mentioned rain cover pocket is on the front. – XS/S: 1.50 kg (3 lb 5 oz). – S/M: 1.53 kg (3 lb 6 oz). – XS/S: 53 l (3234 cu in). – S/M: 55 l (3356 cu in). – XS/S: 71 x 33 x 25 cm (28 x 13 x 10 in). – S/M: 76 x 33 x 25 cm (30 x 13 x 10 in). – Main fabric: 210 D ripstop nylon. – Secondary fabric: 210 D HT ripstop nylon. Maximum weight: 50 lb (23 kg). – XS/S: 33 – 43 cm (13 – 17 in). – S/M: 41 – 51 cm (16 – 20 in). – XS/S: 58 – 122 cm. – S/M: 64 – 135 cm. *This is for the M size. The prices for the three packs at the moment of writing this text are $230, 230, 290. To see the updates please follow the links. 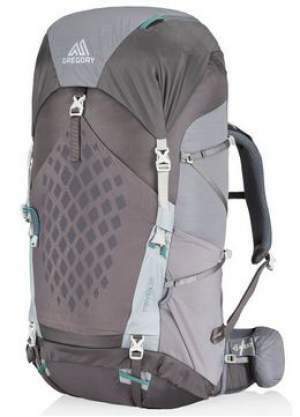 To conclude this text about the Gregory Maven 55 pack for women, as you realize this pack offers a lot of adjustabilities in the harness and in the hip belt. So, it can be used by several family members and by growing youth. The price is high, but this is normal for such a quality tool; note that you have two bonuses here, the rain cover and the daypack. Some of its features are unique. 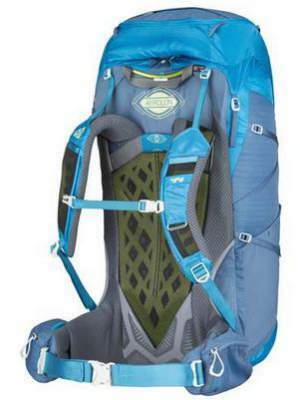 Yet another very lightweight option is this Osprey Eja 58. If you need a smaller or a bigger pack from the same series, see my Maven 45 and Maven 65 reviews. 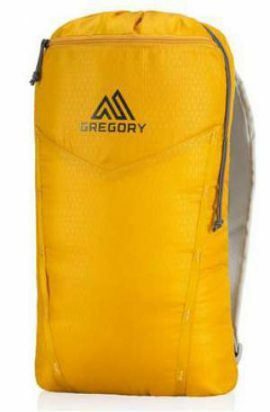 The corresponding packs for men are Gregory’s Paragon series with the same features, the 68 liters pack and 58 liters pack are presented in my separate posts. Thank you for reading. I shall be happy to hear from you, there is a comment box below. Have a nice day.